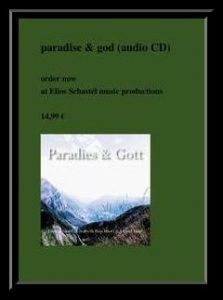 in this menu issue you can find informations about the audio CD paradise & god. You can obtain the CD from August 2017 on in the public trade, on amazon.com and at the Elios Schastél film productions on this website. Jazz and classical music are united by interpretations. Songs of the medieval times until contemporary music and new compositions by Elios Schastél are summarized in an audio CD. All contents of this website are made by the Elios Schastél film productions.